Texas is great for many reasons, top of the list is the fact we do not have a state income tax. Then you get a letter from the Appraisal District. Yep – it’s your tax bill. Yep it applies to your property values. So what’s all the fuss about high taxes in 2018? Well, unless you live under a rock, we have had what you call a seller’s market which has caused a state-wide increase in home values. And for all the frivolity amongst us home owning, equity hoarding, suburban peoples – we have to pay the piper – err tax man. And for some of us it means we might see a big uptick in our tax bill. You can expect that the average increase is about $220 – $270 for every $10,000. 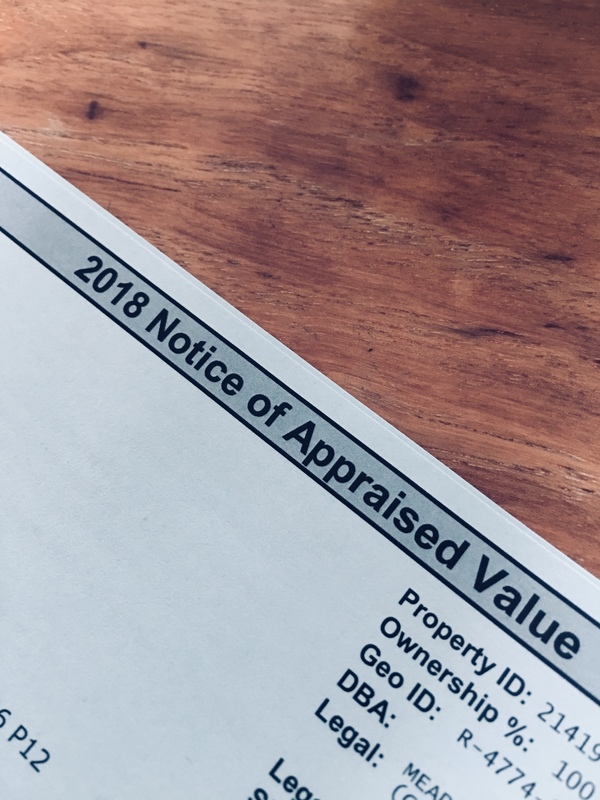 If you’ve never filed for a Homestead exemption – then you’re appraised value will have no cap and this unchecked amount means your bill could sky rocket. Is that you? Well friend, don’t despair, Texas is still great and awesome and we have a plan for you. Namely you can protest your rate. REMBER: the taxing authority has no access to real property values – they base their numbers off of estimates – you can only get real property values from a real estate pro. Also the new tax law only lets you write off up to $10k of your property tax bill. If you go over, your burden is more starting in 2018. As I said earlier, this is Texas so don’t despair. Go outside and watch a sunset – or puppies on Face Book – or bleating goats – anything to makes you happy. 1. The first step is to notify the district of your appeal BEFORE the May 15 deadline (per the instructions you received with your appraisal). You can protest online or appeal for a review by actual people. If you choose appeal by real people – got to step 2. 2. Next call The Skorick Team and get comparable sold properties for 2017 with pictures. 3. Meanwhile write down everything you dislike about your house. This should be the list of things like all the stuff you never got around to upgrade, the teeny tiny size of the yard, the easement that has kept your family from true outdoor happiness, the fact that your house backs up to a nuclear waste site – anything that you can find as negatives. 4. Take time-stamped pictures of your own home. You need to create the case that the appraised price per square foot for your home is out of line and higher than those comparable sold properties in your neighborhood. 5. Wait for your appeals date and time to meet at the Appraisal District. 6. Prepare to meet the wise older officials – this is a local board of volunteers, typically retirees from the industry who hold hearings for exactly your grievance. When you arrive to the appraisal office you’ll be assigned a room and waiting area – then you sit and think happy thoughts. 7. Above all else your mantra for this day is “be friendly to the volunteers.” Kindness goes far with appeals officials. As opposed to one I witnessed first hand – don’t storm out of the room in a tirade. That man neither got his taxes lowered or improved his health. Angry people die early – don’t die. 8. State your case with your documents. The actual person who appraised your home may be on hand to clarify their decision. They will pull up your neighborhood and also consider your documentation and compare to their own, your number against their number. Now if you’ve been nice, they most likely will meet you in the middle. Or even better, give you the lower rate. Just remember that those guys are on your side. What Einstein said is true – like philosophy – what you pay in property taxes has little to do with actual math and more to do with one’s perception of math. If you remember to be friendly and present your reasonable “math” in a pleasant light, you should find that many, not everyone, but many will want you to succeed.